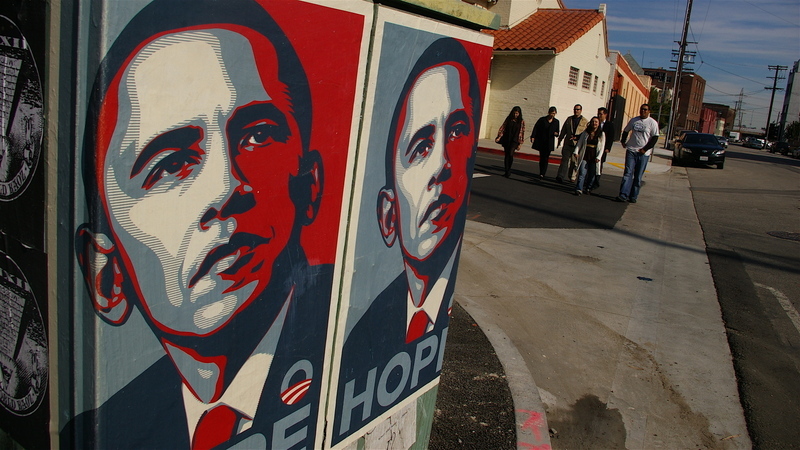 The propaganda parody of Shepard Fairey's self dubbed "experiment in phenomenology" crosses into political image making with his limited edition––and already sold out––Barack Obama "Hope" and "Progress" posters. The endorsement reflects the artist's conviction for the candidate and uses campaign staples, red white and blue, as reflective hues. 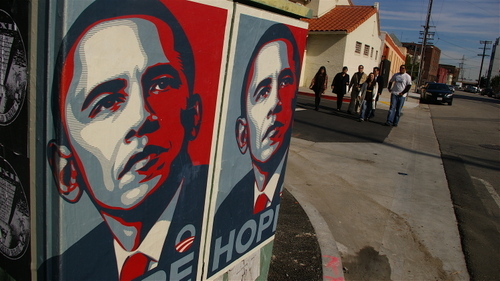 The "Obey" button worn by Obama supports Fairey's manifesto that the "medium is the message" –– or may imply that Andre the Giant will be selected as a running mate. With the two Democratic candidates debating tonight at the Kodak Theatre, it's too late for Camp Clinton to hook in Robbie Conal and provide a rebuttal. No word if civic leaders attending the debate will arrive on the Red Line. 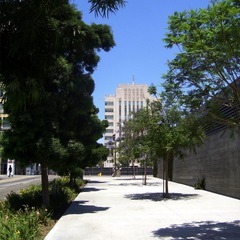 Above: "Hope" at the edge of Joel Bloom Square. 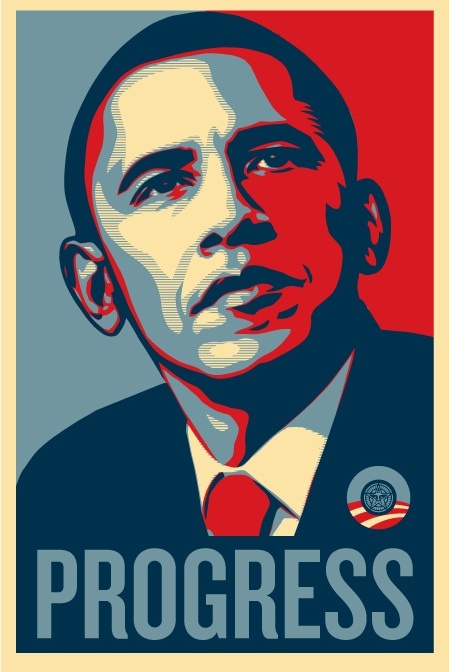 Below: "Progress" via ObeyGIant. 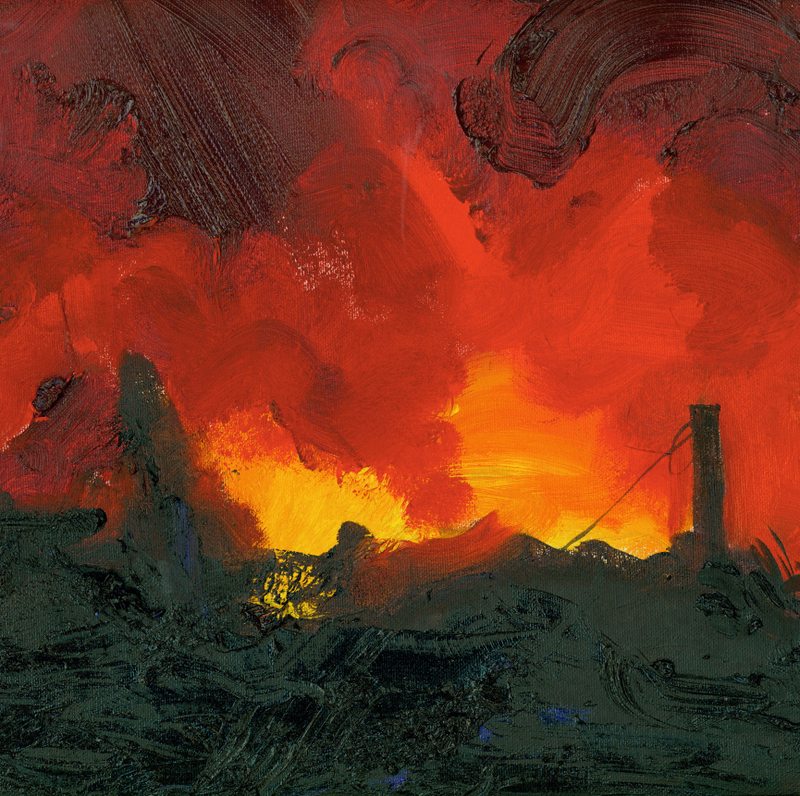 Artist Sandy Rodriguez recent appearance in Walter Maciel Gallery's group show, Generalized Anxiety Disorder, gave her burning Los Angeles landscapes, combined with a previous installation of helicopters hovering over, more exposure. The city burning while under surveillance was on tour. 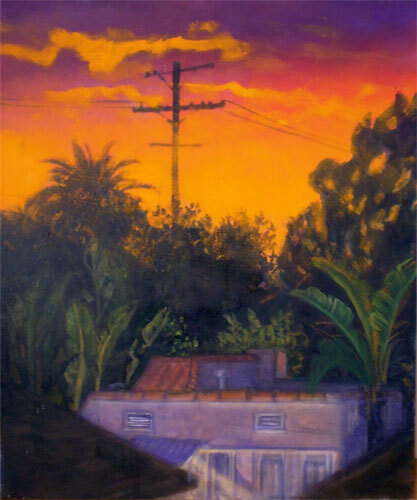 Her landscapes with ‘copters first appeared in the small Echo Park Underground Gallery, where if you met Rodriguez in person you would have seen eyes that watch everything with broad peripheral vision, seeking a way to connect or respond to a presence. By keeping a conversation moving with intellectual fury, lock and loaded with charismatic clip and quips that shoot holes in any previous description of what role a Chicana artist should be playing, she becomes a part of a life long narrative that extends from three generations of female artists in her family. For those who didn't look at all the photos for the LAT's L.A. to announce Broadway makeover, Gilville's Joe "Big City POZ" Cornish and Ruby were captured by LAT photographer David Sprague. 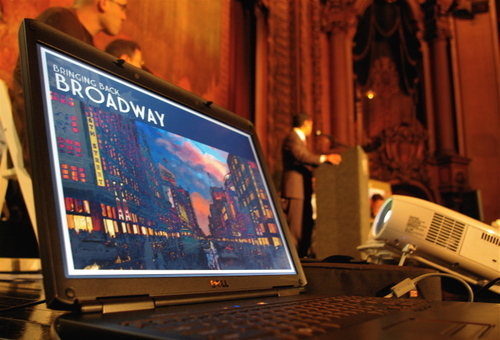 On stage at "Bringing Back Broadway" press conference. Shhh..the mayor is speaking. BRIGHT LIGHTS INSIDE THE LOS ANGELES: Inside the Los Angeles, lit interior details framed the intros to the $ 36.5 million plan to update Downtown’s historic Broadway corridor. 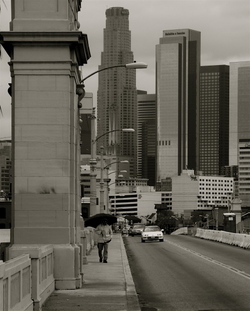 The idea is to find a new version of it's former glory . . –– The Los Angeles was buzzing as the players spoke on-stage and off how this mixed use of people and agencies will anchor change . . –– Others have tried, but the difference may be that this script follows a Downtown growth spurt, and investment is not expected to be the opening act that will revitalize all of Downtown. With a ten year timeline, it may end up the finale for Downtown's renaissance. The move comes as the city is undertaking a bridge-improvement program that will affect six of the river bridges. The impending upgrades have lent a sense of urgency to those who think that the structures deserve special status. 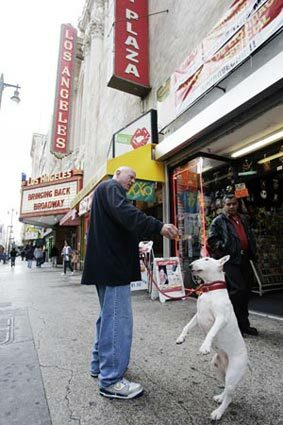 NO TRUTH TO MY RUMOR: In Downtown Los Angeles, a man with a cane found himself detained by local police after he was seen “walking funny" on Broadway, according to witnesses standing in line to enter the Los Angeles Theatre. The historic theater was the venue for a public assembly when the disorderly male was seen tipping his hat to female attendees, then attempted to enter the lobby without a ticket several times. 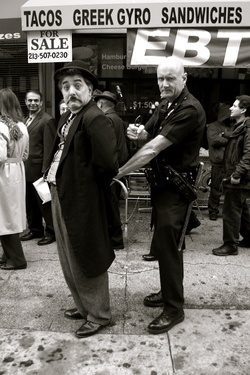 He would only identify himself as "a tramp" and remained silent during questioning by LAPD's keystone police authority. The alleged tramp was soon released and later welcomed into the theater. 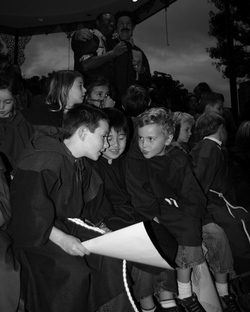 No further incidents were reported. Pictured: Ruben Fernandez and LAPD Commander Andy Smith before Angeles Theater press conference introducing "Bringing Back Broadway"
I e-mailed a smoke signal to the spirits of civic nerds. I'm out here... floating... waiting. There is nothing further to report. The photo of the Number 19 is for commenter and namesake, Maria Langer, the Arizona-based New Yorker who is "starved for a GOOD deli sandwich." While covering the dedication of Langer’s Square Thursday, I listened in to KPCC’s Off Ramp reporter John Rabe ask Norm Langer "When are you going to open up for dinner?" 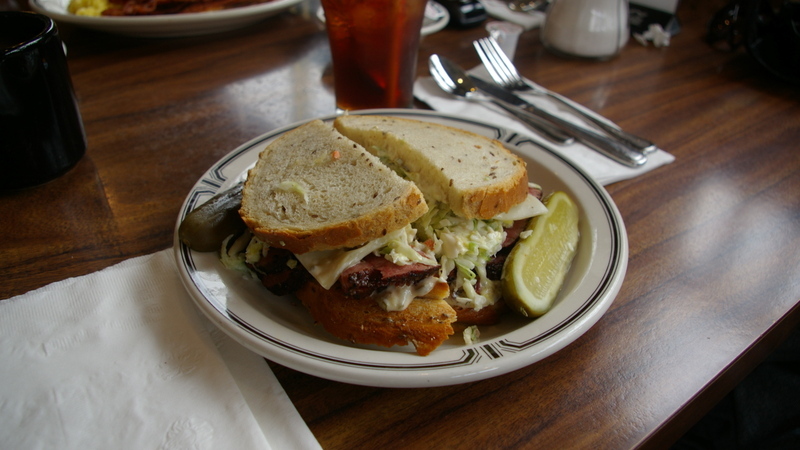 Norm Langer says with Downtown’s expansion, the deli is considering a lot of changes, including later hours; "Possibly at the end of summer."